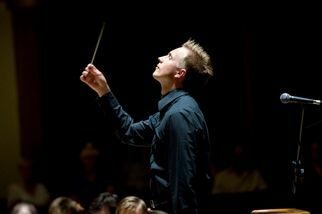 Guest conductor Vasily Petrenko’s detailed, lovingly-sculpted rendition of Ravel’s Mother Goose Suite upstaged three musical war-horses at Wednesday evening’s OSM concert. One doesn’t usually expect the opening work, and the shortest, to be the evening’s highlight, but this performance was so mesmerizing, tightly woven and articulately expressed that expectations were high for the rest of the program. Although the four works share that rhythmic ebb and flow characteristic of the sea, and cumulate in radiating climaxes, the subsequent works couldn’t quite match the Orchestra’s performance of the Ravel. Scriabin’s Poem of Ecstasy is like an assault on Everest, and the Orchestra rarely faltered. The strings played furiously, the brass wailed and the climaxes were blistering, especially the last two which must have been played fffff! Principal trumpet Paul Merkelo delivered a strong performance, although he came in at the beginning rather shrilly and with one whopper of a wobble. The young Quebecer Charles Richard-Hamelin, who has been cleaning up on the competition circuit, gave an impressive interpretation of Prokofiev’s Third Piano Concerto. He played at a galloping pace in the outer movements— evoking their wide range of colors and dynamic contrasts—and brought a tender simplicity to the lyrical middle movement. After throttling the audience with Scriabin and Prokofiev, Debussy’s La Mer seemed to come off as an afterthought. It lacked the finesse of the Ravel, and at times the Orchestra lost hold of the underlying tension. The climaxes gave the impression of coming out of nowhere. Concertmaster Andrew Wan’s various solos were consistently captivating. Petrenko’s conducting style was refreshingly honest and without histrionics—subtle and economical in the Ravel, expansive and embracing in the Scriabin and Prokofiev. A candidate to replace Nagano in 2020? This listener, for one, would be delighted.